The Super Smasher is a self-adjusting; automatic feed, hydraulic building-in machine. It’s the first machine of its type to be manufactured, and so easy to use with the its touch screen LCD control panel. All cased-in books are placed into one Smashing Station that houses three nipping stations, maximizing production. 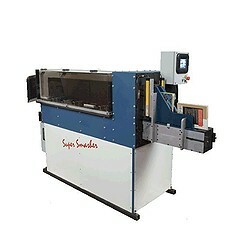 The Super Smasher is completely automatic and has an in-line feeder and efficient built-in stacker delivery system. The Super Smasher can produce up to 18 books per minute which is over 1000 books per hour! All the operator has to do is feed the books into the machine at the in-line feeder station because the Super Smasher is completely self-adjusting. The station has an electric eye that senses books and automatically cycles the machine. The general bulk feature allows the operator to adjust a set bulk range enabling faster machine speeds. The touch screen control panel permits operators to easily access machine features such as dwell time, servo homing, manually indexing, or troubleshooting a machine fault. The control panel also includes a counter for convenience. After the books are pressed in the smashing station, the books travel through three nipping stations (a safety guard box lifts open for easy access to joint irons located in the rear of the machine) that apply up to 1,500 pounds of hydraulic pressure to the joint area of each book. The three nippers provide dwell time in the joint area enabling the machine to run at speeds up to 18 books per minute. If you have any questions or are interested in purchasing the Super Smasher, visit us at SpiralBinding.com. We have great pricing on a full line of Hard Cover Case Making Machines. Call us at 1-800-631-3572 for more information!